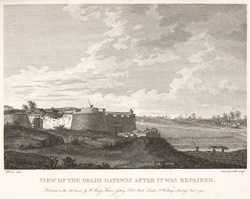 Etching with line-engraving of a view of the Delhi gateway by Hawksworth after sketches Robert Home (1752-1834) had made when he had accompanied the troops in Lord Cornwallis's campaign against Tipu Sultan in 1792. Plate 5 from Robert Home's 'Select Views in Mysore, the country of Tippoo Sultan' published in London in 1794. Bangalore, the capital of Karnataka, was founded by Kempe Gowda in the 16th century. In the late 18th century, the Muslim rulers Haidar Ali (r.1761-1782) and his son Tipu Sultan (r.1782-1799) fought against the British over the control of Southern India. The Fort at Bangalore fell to the British in 1791. Today, the Delhi gateway is the only part of the fort that survives. It contains an Arsenal and fragments of Tipu Sultan's palace.